Amundi’s comme-ci-comme-ça flotation embodies the current state of Europe’s new-issues market. The Credit Agricole-owned asset manager’s stock opened up a fraction on Nov. 12, after price-setting expectations had previously been reined in. The 13 external banks working on the deal alongside Credit Agricole and Societe Generale haven’t exactly proven that quantity begets quality. In general, the listing has delivered what was needed: an exit for Societe Generale. And remaining owner Credit Agricole is spared embarrassment. At one point, shares in Amundi, in which the French lender will retain at least 75 percent, rose as much as 5.9 percent in morning trading. European flotations are generally regarded as well priced if they close between 5 percent and 10 percent higher on day one. Nor has it been straightforward. This is Euronext’s largest new entrant for 10 years, with a valuation of 7.5 billion euros. SocGen wanted to sell its entire 20 percent stake. Amundi’s heavy skew to fixed income may have scared off some investors, and others may have questioned whether a product-sharing relationship between Societe Generale and Credit Agricole will endure. Other IPOs haven’t made it: music-streaming service Deezer and smartcard maker Oberthur Technologies both pulled Paris listings in recent weeks. But then, they didn’t have 15 banks behind them. The crowded roster at Amundi is partly about “reciprocity” – the practice of using as many rivals as possible for your own deals in the hope they’ll return the favour later on. But the three with the standout roles are the biggest names in new-share issues: Goldman Sachs, JPMorgan and Morgan Stanley. Balancing a good price with a healthy share performance ought to be their speciality. Pricing new listings isn’t an exact science. And banks often gripe that working with too many other arrangers can ratchet up the confusion. But with investors finally becoming more discerning after several IPO disappointments over the last two years, the banks who earn fees from underwriting could have done with Amundi’s debut dazzling. 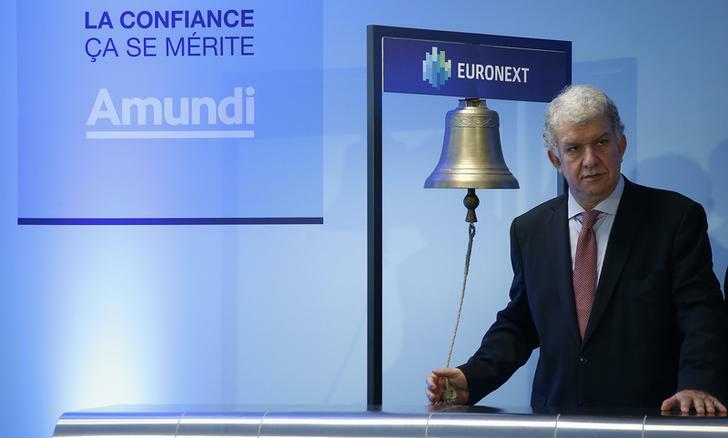 Amundi CEO Yves Perrier rings the bell during a ceremony for the debuts of Europe's top asset manager on Euronext Paris stock market at La Defense business and financial district in Courbevoie near Paris, France, November 12, 2015. Shares in Amundi opened up slightly on Nov. 12 after the Credit Agricole-owned asset manager priced its initial public offering at 45 euros, valuing the entire business at 7.5 billion euros. Shareholder Societe Generale is selling its entire 20 percent stake for 1.5 billion euros. Credit Agricole, which owned the other 80 percent of Amundi, will sell a maximum of 225 million euros of shares if a 3 percent over-allotment option is fully exercised, taking the total offering to 1.7 billion euros. Even without that, Credit Agricole is selling 2 percent to Agricultural Bank of China. Amundi had narrowed its IPO offer price range to 43 to 45 euros from 42 to 52.50 euros initially. Credit Agricole, Goldman Sachs, Morgan Stanley and Societe Generale are acting as joint global coordinators, joint lead managers and joint bookrunners for the IPO. Citigroup, Deutsche Bank, Merrill Lynch and UBS are acting as joint lead managers and joint bookrunners. ABN Amro, Banca IMI, Banco Bilbao Vizcaya Argentaria, Banco Santander, Nomura and UniCredit are acting as co-lead managers. By 0936 GMT, shares in Amundi were trading up 3.5 percent at 46.5 euros apiece.